After consuming this smoothie I couldn’t stop kicking myself for not using sage in a smoothie before now. 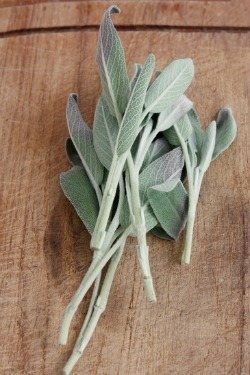 The sweet savory flavor of sage, and its myriad health promoting properties, make it a superb smoothie ingredient. My adventures of incorporating more and more herbs and spices into my smoothies has proven quite successful. I encourage you to play with the various herbs and spices as well. While researching sage I uncovered this cool little nugget: the International Herb Association awarded sage the title of “Herb of the Year” in 2001! Below you’ll find a very basic sage and banana smoothie recipe. I encourage you to incorporate a few of the add-ons and create your own unique version of this smoothie. I added frozen blueberries, spinach, and maca to my creamy custom creation. Enjoy! Put the ingredients into your high speed blender and blend for around 30-45 seconds or until your desired consistency is reached. If you make your own version of this savory sage banana smoothie please tell me all about it in comments below. Happy Blending!